Paris: chez Crochard, 1817. 1st Edition. Hardcover. 8vo - over 7¾ - 9¾" tall. 8vo (193 x 121 mm). xxviii, 610 pp. and 12 engraved plates; xvi, 575  pp. and 2 engraved plates. Contemporary tree calf, spines decorated in gilt and with gilt-lettered labels (boards rubbed, corners bumped, worming to boards and spine), marbled endpapers. Little age-toned internally, very minor occasional spotting. Fine set. ----Duveen, p.440; Bolton I, 707. - FIRST EDITION of Orfila's textbook of medical chemistry which went through eight French editions and was translated into several languages. Mathieu Joseph Bonaventure Orfila (1787-1853) was a Minorcan-born French toxicologist and chemist, and the founder of the science of toxicology. He was appoined Professor of Forensic Medicine at the Faculty of Medicine of Paris in 1819. Very Good. 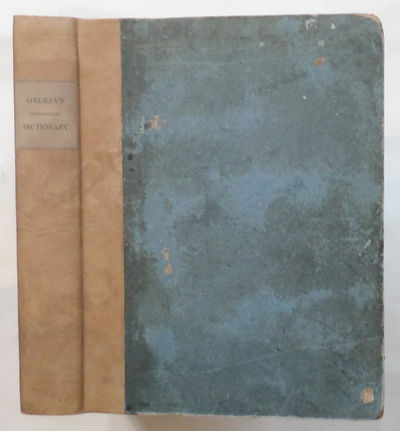 London: Archibald Constable and Co. / Longman, Hurst, Rees, Orme and Brown, 1817. First Edition. Recent Quarter Morocco. Fine. 7 7/8" Tall. Three volumes, complete with half titles, volume short titles, and original preliminary and final blanks (two preliminary blanks in Vol 1). A tall copy, pages 7 5/8" tall, all edges deckled and uncut. Very small old library discard stamp on each title, no other marks. Bound in late 20th century red morocco over very attractive marbled paper, with unusually thick boards (5/16"), and new endpapers. A fine set. Paris: Chez Treuttel et Wurtz (De L'Imprimerie De Madame Huzard). 1817. Volume one only. 536pp. Full polished leather, gilt-stamped red and black spine labels. Three fold-out figures and maps. Text in French. 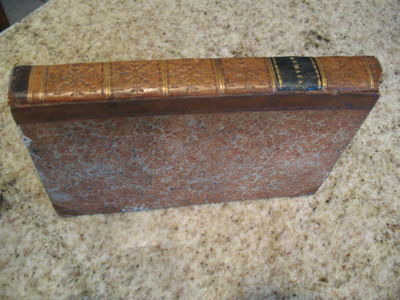 Ex-University library with bookplate on front pastedown and spine sticker, leather dry with a few abrasions, else still very good. .
Loss of the American brig Commerce, wrecked on the western coast of Africa, in the month of August, 1815. 4to., large folding engraved map (of Africa), short closed tear, no loss and now neatly repaired, xvi + 618 + (2)pp., including the final advertisement leaf, old, perhaps original, boards, neatly rebacked and labelled, entirely uncut. An excellent, large, copy sometime in the library of The Cruising Association (label on pastedown, small blindstamp on margin of title-page, gilt stamp on cover).Publisher: London: John Murray.Year: 1817Edition: First English edition (published the same year as the Hartford 1st.). London: John Murray, 1817. First Edition Thus. Original Quarter Calf. Very Good. 8 3/8 " Tall. (I), 210; (I), Viii, 214. Quarter Calf, 6 Compartments, Black Morocco Title Label. 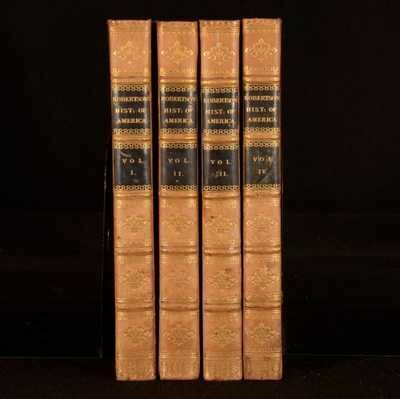 First Combined And Complete Edition, With Fifth Edition Of The First Part, Third Edition Of The Second Part, Including The Appendix At The End Of The Second Part, First Printed Here (In This Third Edition Of Part Ii.) Original Quarter Morocco Over Marbled Boards, With Preliminary And Final Blanks, No Ads, No Pages Between The Two Parts Except The Title Page For Part Ii. Wear To Edges, Joints And Hinges Solid, Joints Beginning To Crack At Edges, Fraying To Tips. Ancient Ownership Name Of George Wood, No Other Names Or Marks. This Edition, With The First Printing Of The Appendix, Is Quite Scarce. New York: Printed for Edmund Blunt at the Quadrant. Sold by Edward Little & Co., Newburyport, 1817. Ninth Edition. Hardcover. Complete, with the fine maps of American ports, including a folding plan of New York Harbour, showing the lower end of Manhattan with the North River (at Paulus Hook) the East River and the Battery, all the way down to Sandy Hook and the entrance to Shrewsbury, with many soundings (p163, 9 x 17"). Charts and plans include: Plan of the Isle of Sable; Portland Harbour; Portsmouth Harbour; Newburyport Harbour; Annis Squam Harbour; Boston Harbour; Cape Poge; Newport Harbour; Long Island Sound (folding); New York Harbour (p163); Little Egg Harbour; Bay & River of Delaware (folding); Chesapeake Bay; Coast of North Carolina (folding); Charleston Harbour; Savannah River (folding); and Vera Cruz. Includes the lengthy Appendix, covering a broad range of information including "Abstract from the Laws of New York, interesting to Masters and Mariners, which includes Wrecks, Servants, Slaves (pertaining to the May 1, 1810 Act abolishing the importation and transfer of slaves); Quarantine Law; Ships Liable for Debts; Searching of Vessels. Edmund March Blunt (1770) was an American navigator, hydrographer and publisher of nautical magazines and guides. 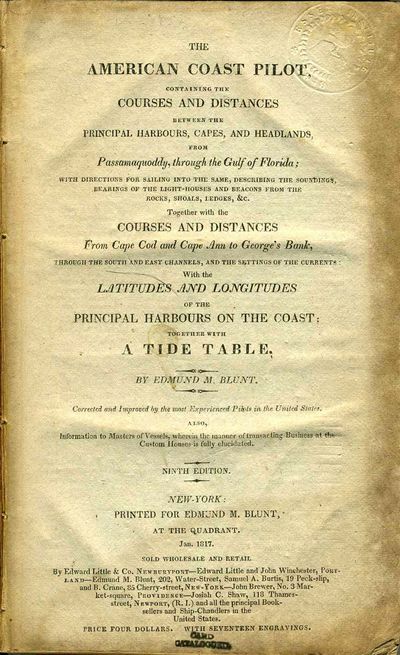 The American Coast Pilot was published from 1796 through 1858, and was printed in 18 editions. 8vo, xvi, 328pp, Table I: Latitudes & Longitudes, 11pp; Appendix, 85pp; ads, 3pp. Advertisements include an illustrated full page ad for Edmund Blunt's shop, showing the facade of the shop with large sign at the very top "Charts & Quadrants" and a sextant as hanging street sign. Full brown calf. Boards rubbed, front board detached but present; spine chipped at top third, library label at base. Internally, early pages a bit toned at edges; bookplate of the Essex Institute inside front board as well as blind stamps of the institute at upper right corner of title page and at every plate corner. Chesapeake Bay folding map with a few cracks and browned at one fold only. OCLC: 1467157. London - Cadell and Davies et al., 1817 Book. VERY GOOD INDEED. Hardcover. The thirteenth edition of William Robertson's History of America. Illustrated, with twofoldingmaps to volume I, two foldingmaps to volume II, one folding plate tovolume III. Collated, complete in four volumes. With the bookplate of William Botfield to the front pastedown of all volumes. William Robertson was a Scottish historian and minister in the Church of England. He published several historical works including his well known History of Scotland. Condition: In uniform full calf bindings with gilt stamping to the spines. Externally, smart with minor rubbing to the joints and extremities. Small patches of rubbing to the spines. Prior owner's bookplate to front pastedown of all volumes, WilliamBotfield. A few marks to boards. Internally, all volumes are firmly bound. Evidence of worming to the final few pages of volume I and to the rear pastedown, to the top margin. Pages aregenerally bright withscattered spots through. Overall: VERY GOOD INDEED..
Philadelphia: Published by Harrison Hall, at the Port Folio Office, 1817, 1817. First American edition. Fleeman 816DW/2; American Bibliography 41162; Tinker 1390. Binding a little worn; text moderately foxed; very good copy.. 12mo, contemporary black quarter roan, marbled paper boards, gilt rules and lettering. Frontispiece facsimile of Johnson's holograph. Bound without the half-title. Johnson's posthumously published narrative of his trip to North Wales, edited with notes by Richard Duppa (1768-1831). 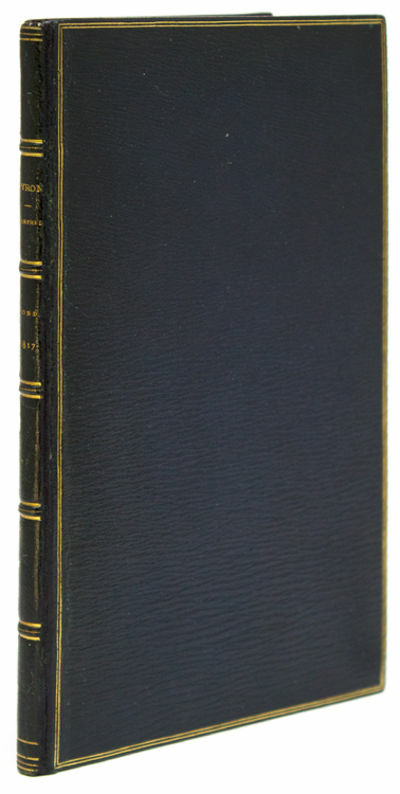 This American edition is the first to contain Johnson's short essay "Considerations on the Corn Laws," first published in 1766. See Fleeman 66.11CC. 1817. unbound. very good(+). Map. Engraving with original hand outline color. Image measures 19.5" x 23.25". 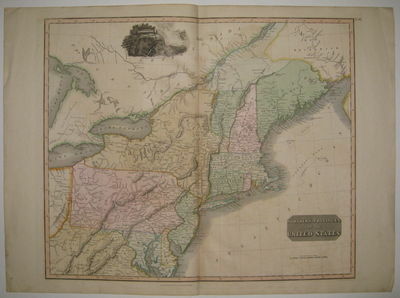 Nicely detailed double page map of the northeastern coast of America, from Maine (the District of Main) to parts of Virginia and Maryland. Shows topographical features, forts, towns and waterways. Includes a beautiful view of Niagara Falls. Published in Thomson's "New General Atlas". Minor overall offsetting. SISMONDI Jean Charles Léonard Simonde de. Storia delle repubbliche Italiane dei secoli di mezzo di J.C.L. 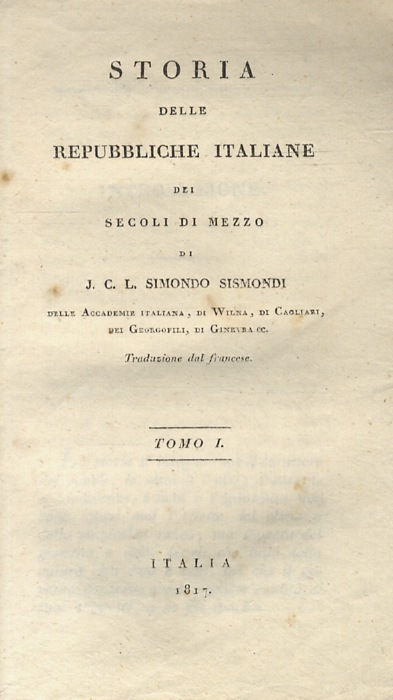 Simondo Sismondi delle Accademie Italiana (sic), di Wilna, di Cagliari, dei Georgofili, di Ginevra ec. Traduzione dal francese. Tomo I. [-XVI]. New York: Kirk and Mercein. 1817. First. First American edition. Tall octavo. 208pp., folding map colored in outline. Publisher's original papercovered boards with printed paper spine, edges untrimmed. Modest loss at the foot, chip on the front fly, map slightly misfolded but sound, and some other moderate wear, overall a very good copy, with the publisher's fragile and uncommon boards in a remarkable state of preservation. .
Saga ifrn Nya Holland. Sthlm, A. Gadelius, 1817. 12:o. 98 s. Elegant ljusbrunt lackat och marmorerat hfrbd med upphjda bind, guldornerad rygg, pergamentskodda hrn och rd titeletikett samt vre st§nkt snitt (Hedberg). Ryggen obetydligt blekt och ytterfalsarna lite ntta och den fr§mre med en liten spricka verst. Ngot lagerfl§ckig. Titelbladet lite solkigt och med uppfodrade skador n§rmast ryggen samt lagad reva upptill. Flera smlagningar i ryggmarginalen fram till s. 26 och uppfodrat hrn p s. 9-10. Svag fuktrand p s. 39-50, en nagg i vre marginalen p s. 83-84 och ett litet hl i ryggmarginalen p s. 85-96. Sista bladet uppfodrat n§rmast ryggen. P titelbladet Fredrik Borgs lnebiblioteks i Lund svartstpl. Almquistiana 202. Ferguson Bibliography of Australia Addenda 691a. Almquist 'ÄùParjumouf'Äù §r frmodligen det frsta svenska sknlitter§ra verk vars handling §r frlagd till Australien. Den nya kontinenten kallas frutom Nya Holland §ven 'ÄùUlimaroa'Äù, ett namn Almquist s§kerligen funnit i geografen Daniel Djurbergs skrifter. Bde Cook och Banks hade hrt ordet anv§ndas p Nya Zeeland som beteckning fr Australien. Fredrik Borg (1827-81) drev lnebibliotek i Lund. Delar av hans bcker hamnade senare i J. A. Sjbloms lnebibliotek i samma stad. MINUTOLI, Johann Heinrich Carl, Freiherr Menu von (1772-1846) and Martin Heinrich KLAPROTH (1743-1817). Only complete edition, privately printed in fewer than ten copies, fine association copy of an exquisitely illustrated treatise on ancient mosaic glass by an important antiquarian and collector. Minutoli provides detailed descriptions of the objects illustrated in pages 5-9. The rest of the text, which reproduces portions of a lecture delivered by Martin Heinrich Klaproth in 1798 to the Royal Academy of Sciences, contains descriptions of probable production methods, including chemical analyses of the methods used to create, apply, and fix the colors, and comparisons to other known examples. Minutoli notes that these "scarce art objects" were passed unmentioned in older treatises on the art of antiquity, possibly because so few survived, and because those few examples that had been found, "showpieces" (Prunkstücke) in private art collections, remained unnoticed until the late 18th century. Born in Geneva of an originally Luccan family, Minutoli became an officer in Prussian army. Partly self-taught (as a cadet, bored with the curriculum, he taught himself Greek, Latin, Italian and English), he became a student and collector of the arts of antiquity. After a research voyage to Egypt in 1820, financed by the Prussian government, Minutoli's Egyptian collection, containing 55 papyri as well as sculptures and mummies, was purchased by the state and formed the foundation for the Ägyptisches Museum in Berlin. The list of the author's honorifics on the title opens with "Major General and Governor of Prince Karl of Prussia." The present copy belonged to his charge, Prince Karl himself, third son of King Friedrich Wilhelm III (whose second son, the future emperor Wilhelm I, Minutoli also tutored). Presumably the few copies printed were distributed to dignitaries. The work is dedicated to Princess Marie Anne of Hesse-Homburg, wife of Prince Karl's uncle, Prince Wilhelm of Prussia. The title represents an early use of lithography. An earlier edition of the text, published in 1815, contained only two plates, one colored and one uncolored. I locate the following copies of this edition: Univ. of Kansas, Leipzig Univ., BnF, Danish Union Cat (7 pl. ), and Frankfurt Univ., and 3 copies of the 1815 edition: Corning Museum of Glass, London Society of Antiquaries, and Strasbourg Bib. Nat. & Univ. (lacking the colored plate). On the author cf. Neue Deutsche Biographie 17 (1994), art. by H. Nehls, 549-551 [online]. 1817. SMOLLETT, Tobias. 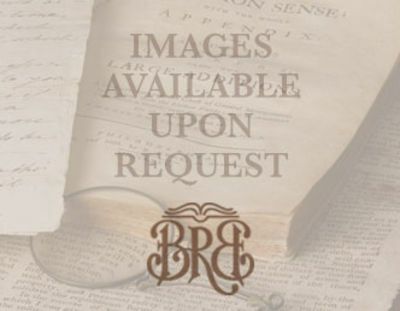 The Miscellaneous Works of Tobias Smollett, M.D. Edinburgh: Silvester Doig, et al., 1817. Six volumes. 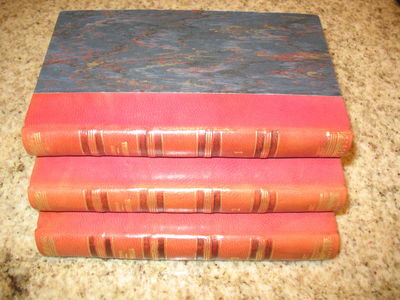 Octavo, 20th-century three-quarter brown calf, elaborately gilt-decorated spines, raised bands, navy and burgundy morocco spine labels, marbled boards and endpapers. 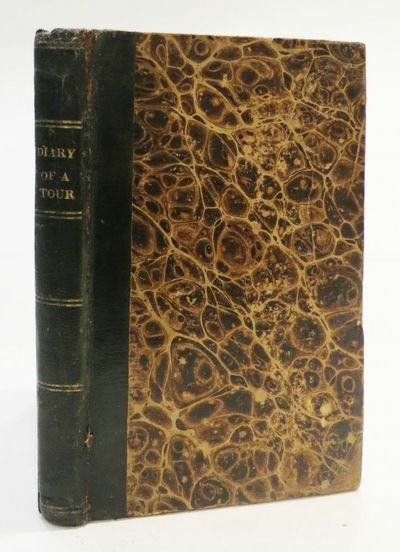 $2000.Fifth edition, with engraved frontispiece portrait, handsomely bound.Includes the picaresque comedies Roderick Random, Peregrine Pickle, Count Fathom, Sir Launcelot Greaves, and Humphry Clinker, along with SmollettÂ’s esteemed Travels through France and Italy and other writings. With a biography of Smollett by Robert Anderson. A fine copy. A SKETCH OF MY FRIEND'S FAMILY. Intended to suggest some practical hints on Religion and Domestic Matters. MALTHUS Thomas Robert REDGRAVE Gilbert R.
1817. Signed. MALTHUS, Thomas Robert. An Essay on the Principle of Population; Or, A View of Its Past and Present Effects on Human Happiness; with An Inquiry into Our Prospects Respecting the Future Removal or Mitigation of the Evils Which It Occasions. London: John Murray, 1817. Three volumes. Octavo, contemporary full diced brown calf rebacked with original elaborately gilt-decorated spines laid down, burgundy morocco spine labels. 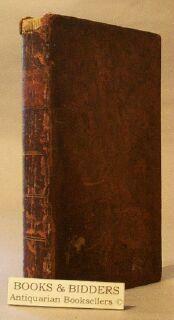 $2800.Scarce 1817 edition of a foundational work in modern economics, from the library of renowned bibliographer G.R. Redgrave, co-author of the Short Title Catalogue (STC), featuring his key notation in Volume I: Â“This is the best edition of this famous work as it contains much addiitonal matter, and many alterations at the hand of the author,Â” handsomely bound in contemporary calf.Â“Malthus was one of the founders of modern economics. His Essay was originally the product of a discussion on the perfectibility of society with his father, [who] urged him to publish. 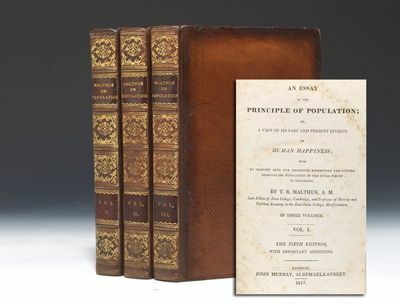 Thus the first edition (published anonymously) was essentially a fighting tract, but later editions were considerably altered and grew bulkier as Malthus defended his views against a host of criticsÂ… The Essay was highly influential in the progress of thought in early 19th-century Europe [and] his influence on social policy was considerableÂ… Both Darwin and Wallace clearly acknowledged Malthus as a source of the idea of Â‘the struggle for existenceÂ” (PMM 251). 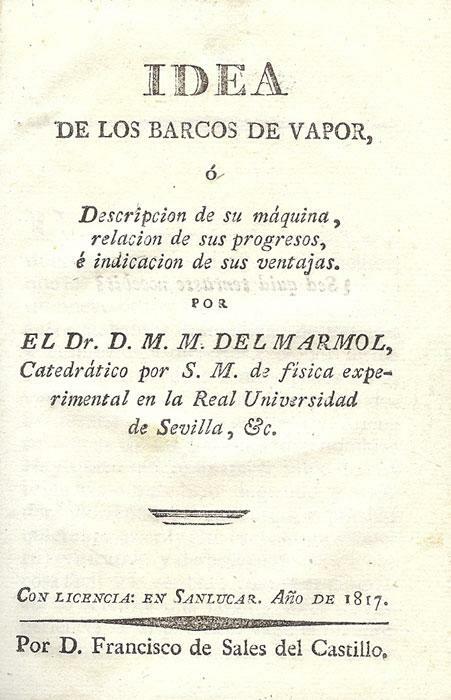 Following the initial 1798 edition, Â“in 1803 Malthus published under his own name the stout quarto that embodies his mature views of his subject. The author confesses in his preface that he had taken too gloomy a view of human nature in his first essayÂ… The achievement of Malthus was the exposition of the theory of population; and his name has been associated so closely with this theory that, like DarwinÂ’s, it has added a new adjective to the language of civilized peoplesÂ” (Palgrave II:670-1). Fifth edition: Â“with important additions.Â” Kress B6974. Garrison &amp; Morton 1693. Goldsmiths 21761. From the library of highly respected bibliophile Gilbert R. Redgrave, with his bookplates. Redgrave co-authored with Pollard The Short Title Catalogue of English Books, 1475-1640 (STC), a foundational bibliography. 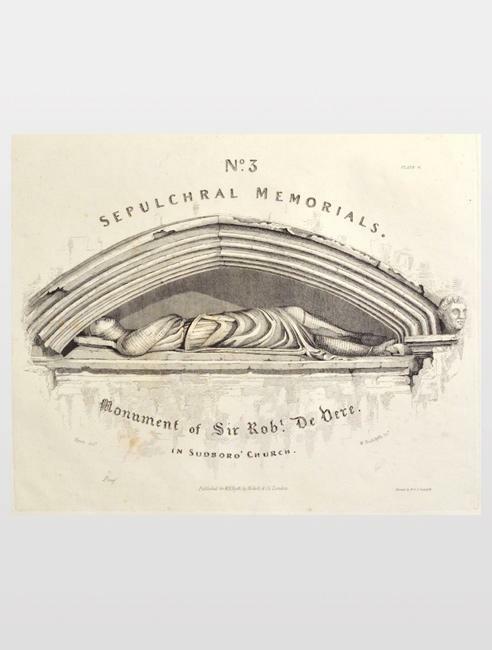 The son of artist Richard Redgrave, Gilbert was also a major art critic, architect and author. As is evidenced by this seminal work, Redgrave often wrote learned bibliographical notes in important volumes from his library. With his date of Â“London. 1885,Â” Redgrave writes in the blank fly leaf of Volume I his informed notation on this key 1817 edition: Â“This is the best edition of this famous work, as it contains much additional matter, and many alterations at the hand of the author. In order to complete the previous editions, four in number, the added matter was published as an extra volume. The replies to M. Weyland and M. Graham in the Appendix [III:388-428] are important. The work passed through six editions in the authorÂ’s lifetime, viz. 1798, 1803, 1806, 1807, 1817 and 1826.Â” Minor marginalia to front pastedowns.Interiors generally fresh with light scattered foxing, some expert restoration and age-wear to binding. A most desirable extremely good copy, scarce in contemporary boards. London:: Rodwell and Martin, 1817-1819. First edition. 8vo. (10 x 6.5 inches). pp.xxxii + 273 + unnumbered fold-out map + 2 (Emendations & Directions to the Binder). Pages untrimmed. Frontis with tissue guard + 4 unnumbered plates, including fold-out map, before p.1. Five unnumbered plates altogether. 77 numbered plates, including numerous extensive fold-outs, all in excellent condition. Contemporary full vellum, floriated gilt border on both covers, 5 raised bands and gilt decorated panels to spine. *****some minor rubbing to the gilt, a short split at the top of the front hinge (which appears old and stable) and a few marks here and there, an excellent copy*****Presentation copy "Lucy Claxton / Rome / bound by Volpak / given by Sir Wm Gell" After investigation of Gell's handwriting samples and consultation with Gell experts, we're comfortable making this assessment. ****A great copy of one of Gell's major contributions to archaeology. 1817. First Edition . ELLIS, Sir Henry. 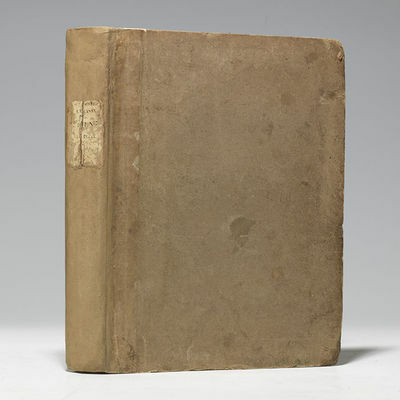 Journal of the Proceedings of the Late Embassy to China; Comprising a Correct Narrative of the Public Transactions of the Embassy, of the Voyage to and from China. London: John Murray, 1817. Quarto, original drab boards sympathetically rebacked, remnants of original printed paper spine label laid down, uncut. 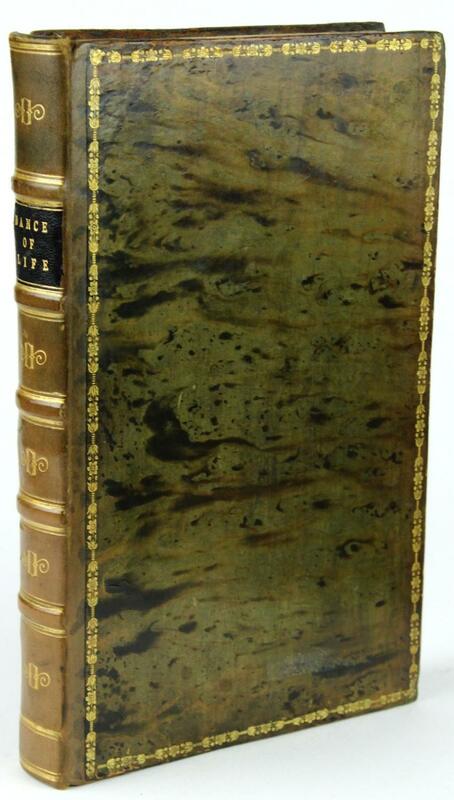 $7500.First edition of this entertaining account of Lord Amherst's embassy to the Chinese Emperor, splendidly illustrated with seven beautiful hand-colored aquatints depicting the Emperor's summer palace at Tien-Sing, the Tong-Chow harbor, a temple near Nankin, the island of Pula Leat, and views of other harbor cities, as well as three maps (one large folding), in original boards. ""After the peace of 1815, the English government turned their attention to the complaints of injustice and exactions on the part of the Chinese mandarins which reached them from time to time from the English merchants at Canton. Lord Amherst was chosen to proceed to Peking as British envoy, to represent to the Emperor Kea K'ing the wrongs which British subjects were suffering under his ruleÂ… Ellis, a diplomat, accompanied Amherst in his embassy to China, in capacity of third commissioner, in 1816. A mission to China was then so rare an event in the history of Europe, that Ellis published in 1817 an authorized narrative of the journey and transactions of the embassy"" (DNB). 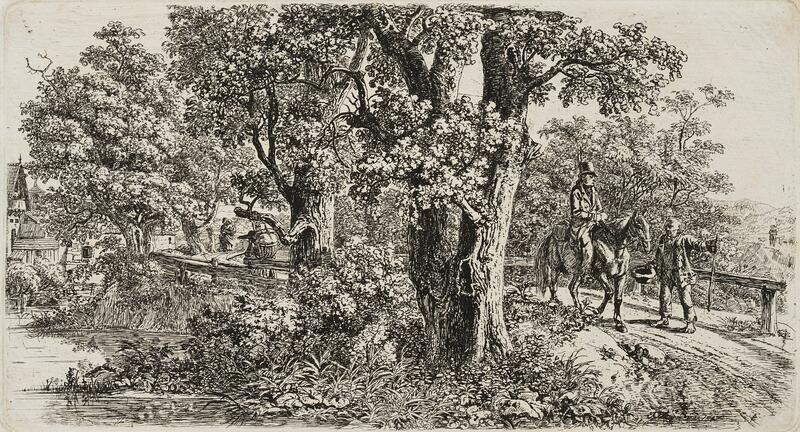 The detailed aquatint plates were prepared by J. Clark from the drawings of Ellis' friend Charles Abbot. With errata sheet at rear. Abbey Travel 536. Hill, 413. Tooley 208. Prideaux, 250. Faded early owner ink signatures on title page.Faint intermittent dampstain along upper edge, a bit of spotting to text, plates clean, with vivid coloring. A beautiful wide-margined copy, desirable in the original boards and uncut.